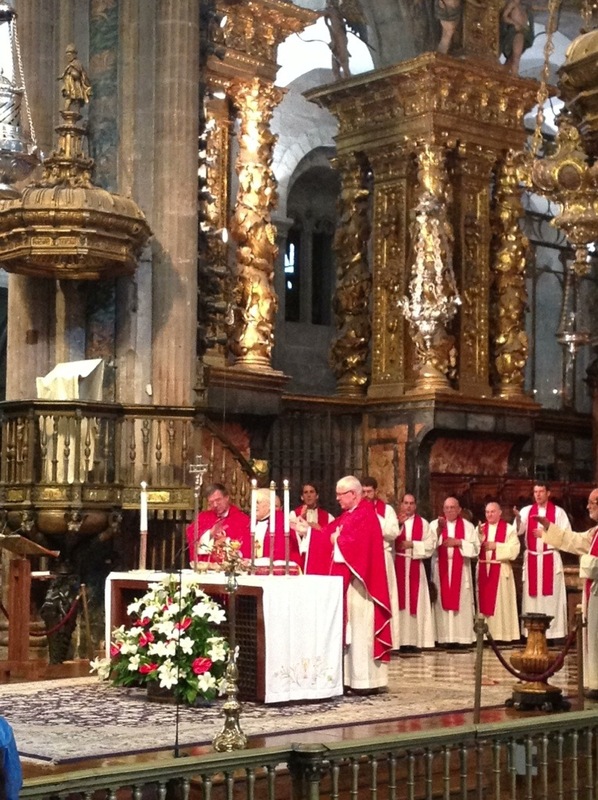 I awoke to rain yet again but I wanted to tour the cathedral and attend the pilgrim’s 12 noon mass. By the time I was ready to venture out the rain had stopped and I was able to capture some outside shots of the cathedral. As I took the above picture, I spied the silver haired lady in the green jacket in the upper right of the picture. It was Chris but I did not see Doreen or Penny. I went down to meet Chris with a big hug and she said that she was waiting for Doreen and Penny to come to the square and then to attend the mass. 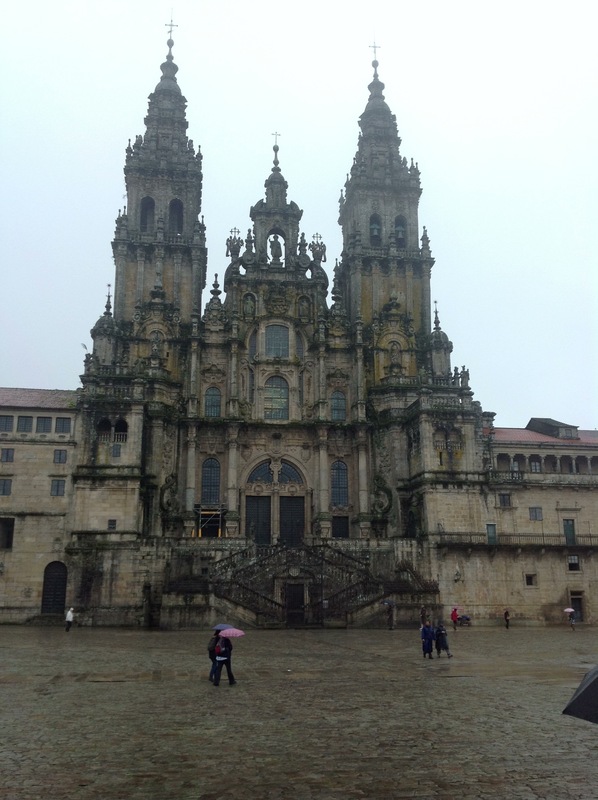 Her brother Roger had taken the ferry and then drove to Santiago to meet Chris as she ended her walk. He did meet her and was walking to the cathedral with her when he tripped and fell which had resulted in a horrible misfortune to her Camino. They had to take Rodger to emergency where it was determined that his left arm was broken by the elbow joint but being that it is a holiday weekend in Santiago, it would be five days before surgery could be done. So, Roger was trying to make arrangements to get a flight back to England to have the surgery there. 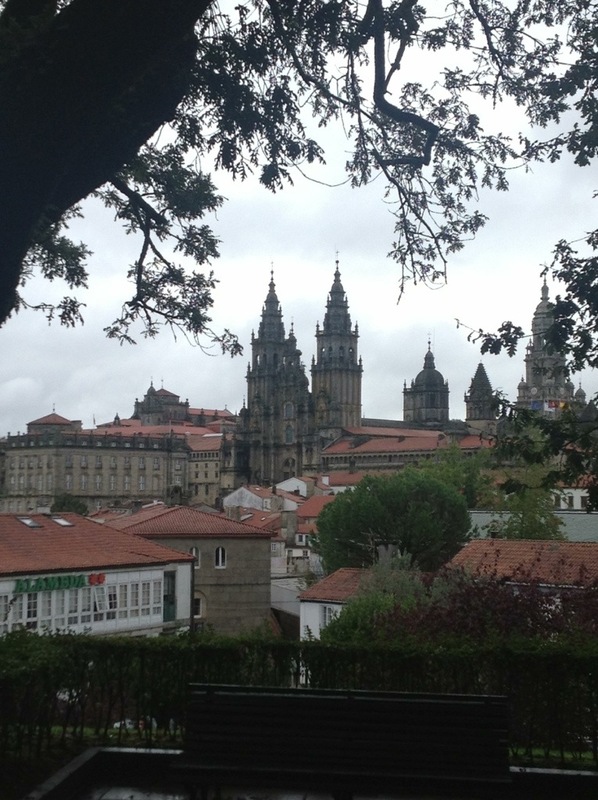 It was not a joyful end to the three ladies Camino. Penny and Doreen met Chris and I in the Plaza and we went to join the pilgrim mass. To our surprise there was standing room only. 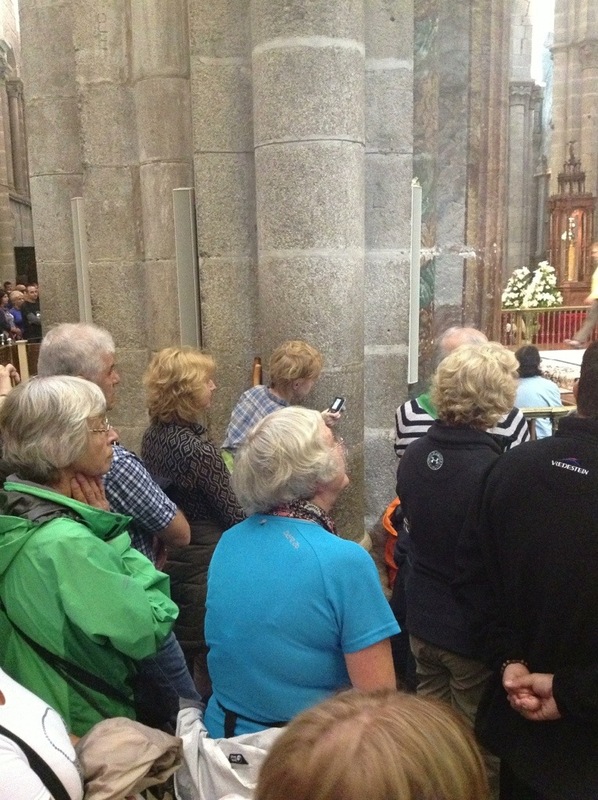 The centre and both side sections were filled with pilgrims who had completed the El Camino. I am estimating about 200 people. 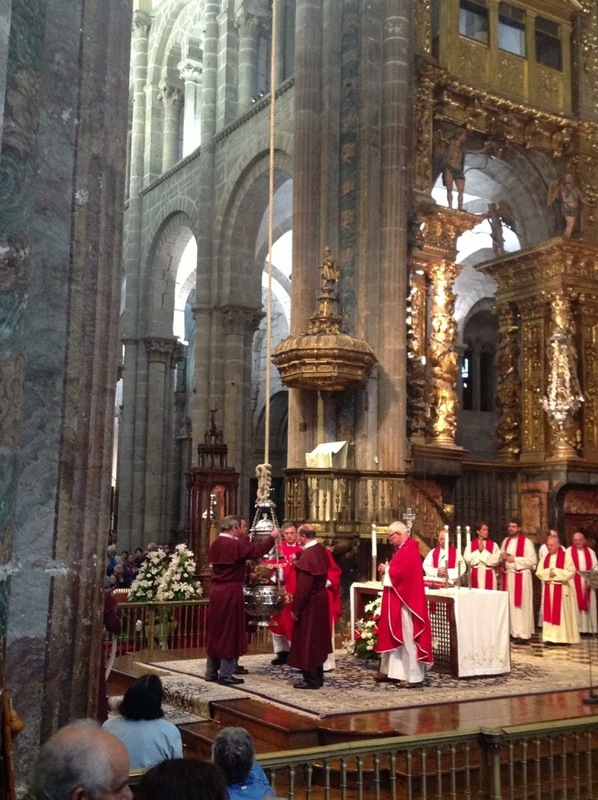 One other ritual, for which Santiago cathedral is especially famous, is the swinging of a massive incense burner down the central aisle of the cathedral during Mass. This incense burner is called a “botafumeiro” and it takes the muscles of several individuals pulling on a single rope to hoist and swing the botafumeiro along its path. 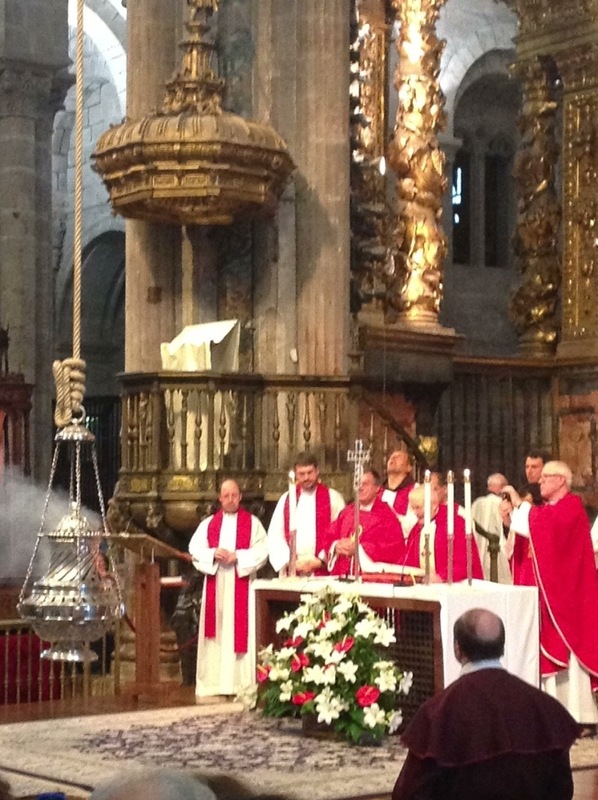 Incense has long been a part of religious services of many denominations, but it is thought that the reason for this exaggerated method of spreading the incense may have something to do with masking the smell that must have filled the cathedral when it was full of pilgrims, many of whom would not have washed for several days. Notice the priest on the right taking a picture. It is ironic because we were cautioned before the mass not to take pictures. After mass we went for a coffee and then I took off for the train station to get my ticket to Bilbao before the 2:00 siesta closing. After purchasing my ticket, I took a walk up to Santa Susana park where there are excellent views of the cathedral and some of Santiago. Art and the Museum of Pobo Galego were located. In the arts centre there was an exhibition of a videographer as well as some still pictures of his work done in the 1930’s. It is also used as a teaching venue so there were students about. 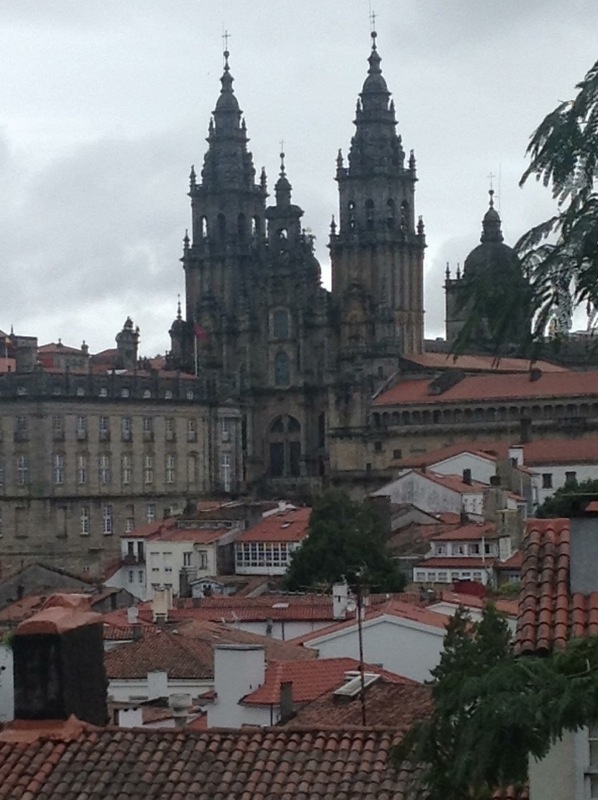 The Museum of Pobo Galego was next door. 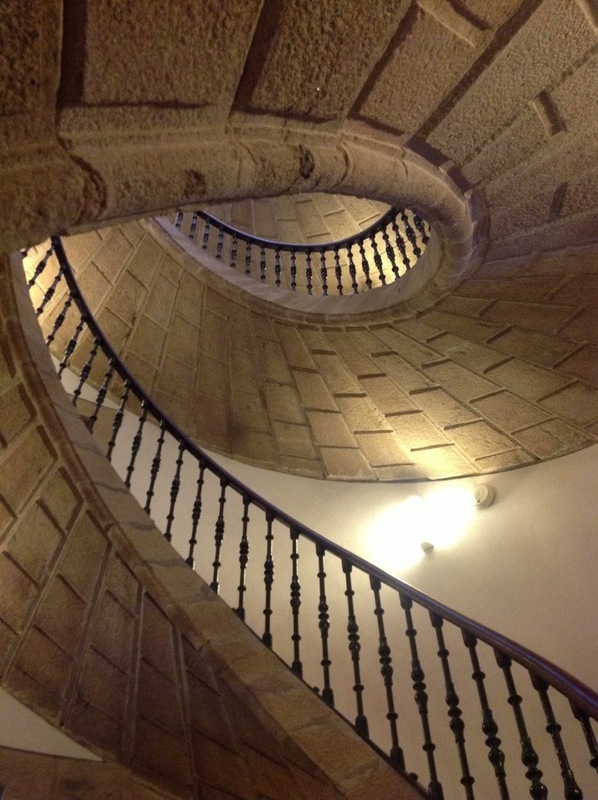 The Museum of the Galician People occupies the former convent of Santo Domingo de Bonaval. 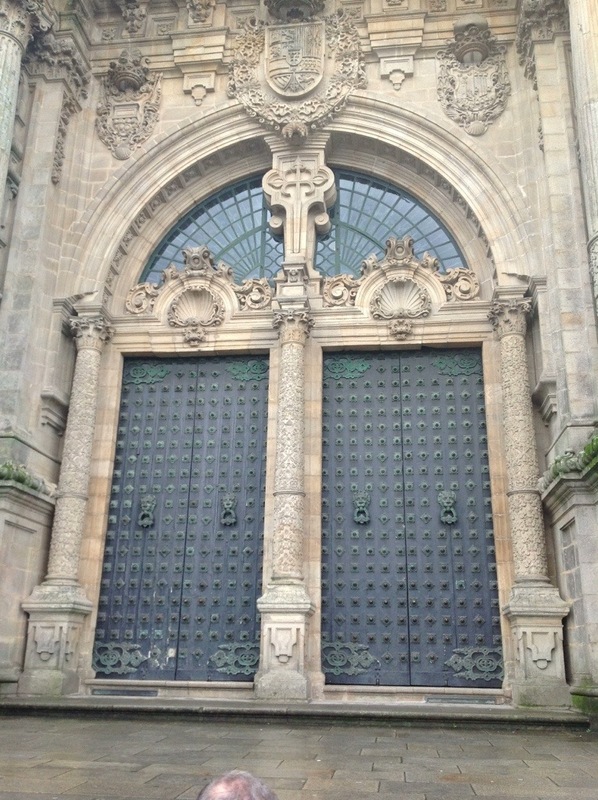 The Association “Board of Trustees of the Museum of the Galician People”, established in Santiago de Compostela on 31 July 1976, aims to investigate, preserve, disseminate, protect and promote the Galician culture in all areas; and specifically, to create and maintain a museum at the service of these goals. 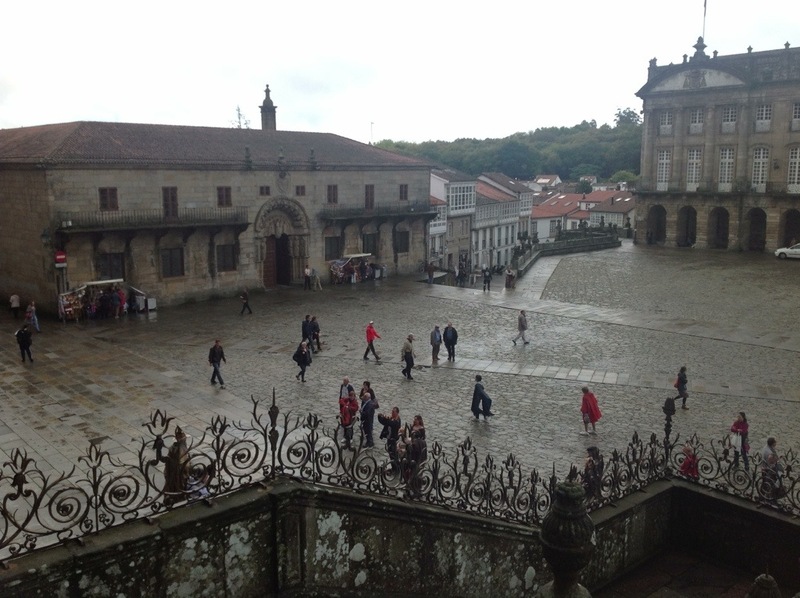 The walls of the convent correspond to the episcopate fray Antonio de Monroi, archbishop of Santiago between 1685 and 1715, and due to Domingo de Andrade. The facade is of small proportions. The cover consists of two major Tuscan pilasters decorated with string fruit’s characteristics that support a curved pediment game and fall to great alintelada door, dominated by the image of the holy founder. Above stands the shell of the house Altamira royal crown. 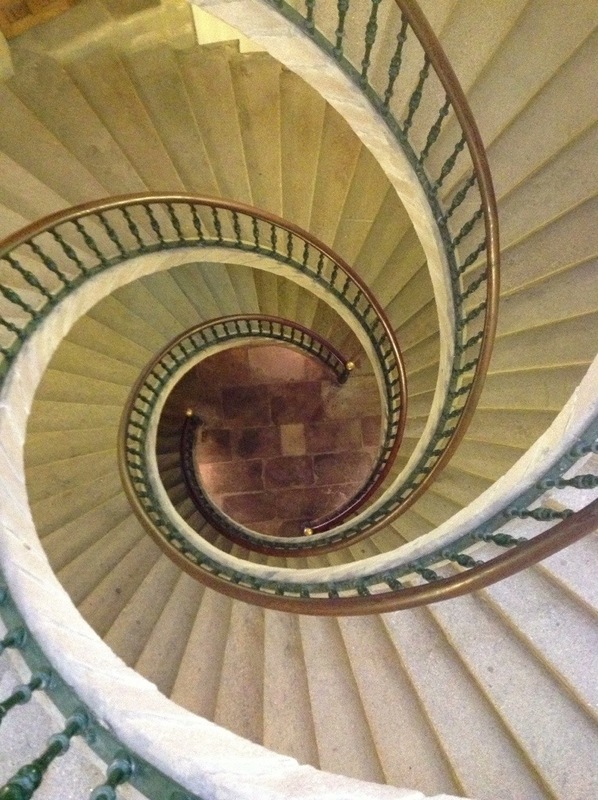 Inside the building, at the northwest corner, worthy of great admiration is the triple helical staircase, which in technical and structural audacity gives a good example of the virtuosity of Andrade. In the same hole developed three separate ramps that lead to the different floors; only one crown in the viewpoint that dominates the city. 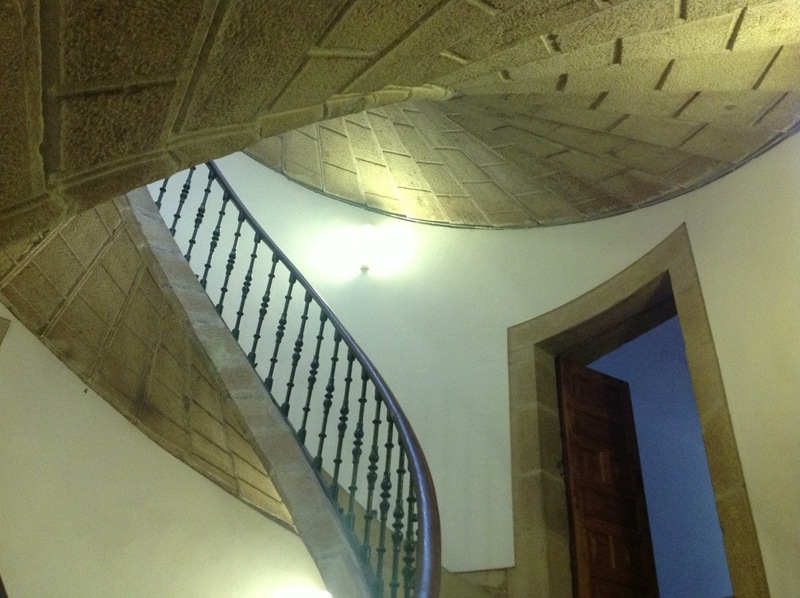 This ladder is considered by all as one of the unique elements of the architectural heritage of Compostela. Totally fabulous!! 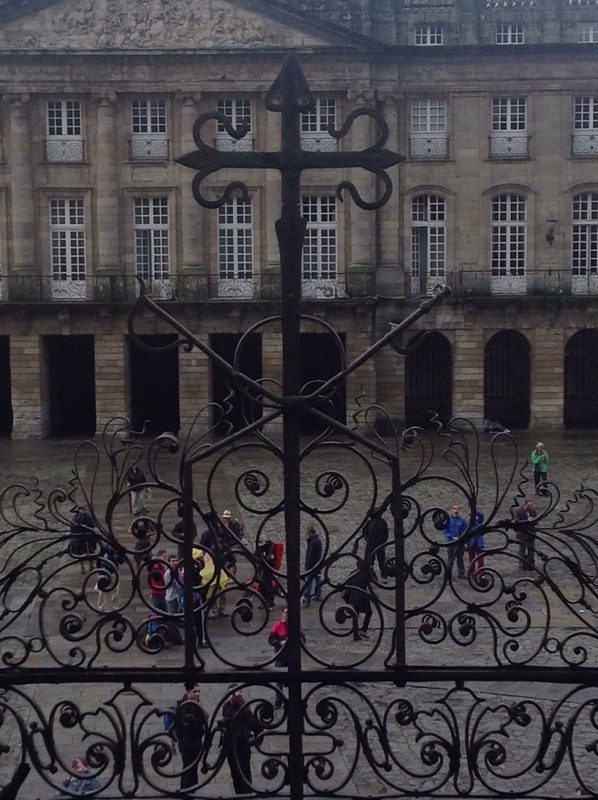 Also, in part of the cloister, there was a photography exhibition of Claude Le Gall featuring the people and region of Galicia. 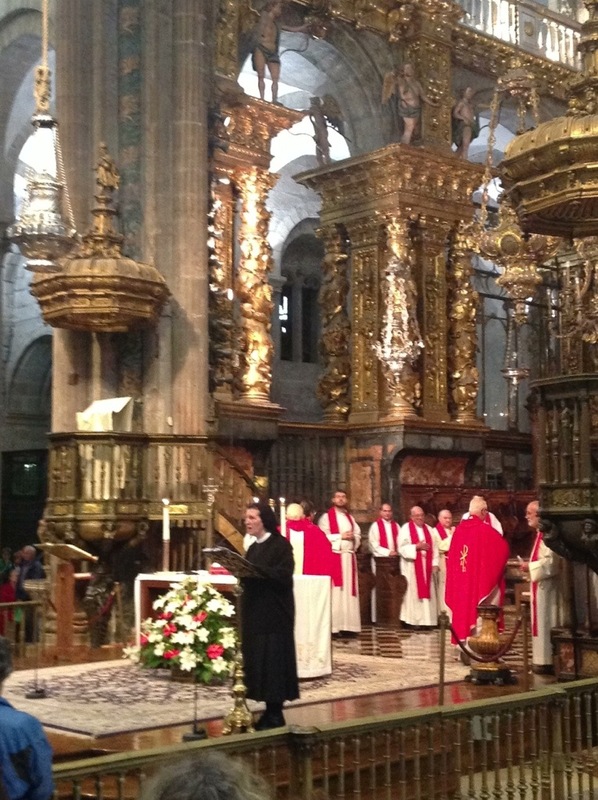 There were several awesome pictures of the agony and the exultation of pilgrims making their way to the cathedral. It was close to 6:00 pm as I was meandering the streets toward my hotel, when yet again who do I bump into but Doreen and Penny who were window shopping. 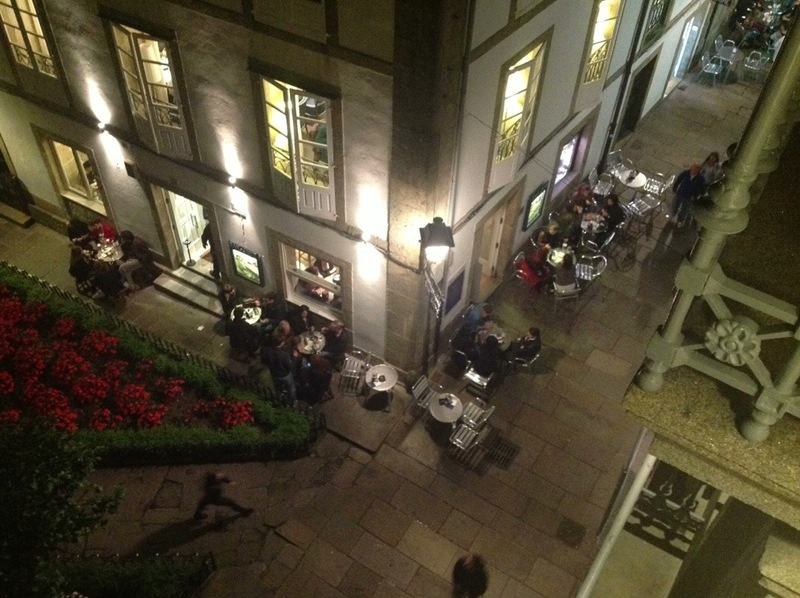 They were going to meet Chris and Roger by the cathedral and then find some restaurant to eat and I was invited to tag along. 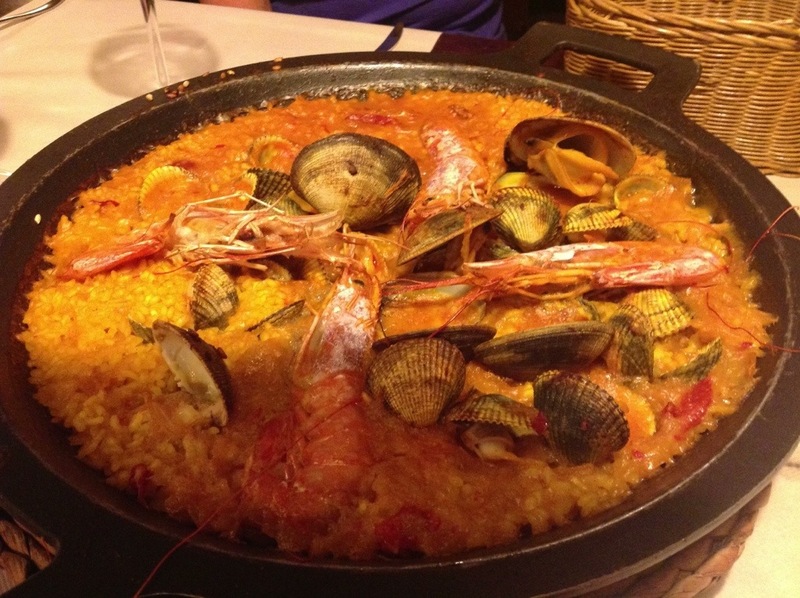 We had a lovely seafood paella and shared stories of favourite people and places along the Camino. As I publish this, it is well after midnight but the street outside is still enjoying the holiday weekend. I thought my last comment would be my very last, I should have known that Santiago was not yet the very end of your journey! I am so pleased that you met up again with Doreen and Chris, I knew you were all there yesterday and was hoping you wouldn’t miss each other amongst all the pilgrims. As a purely egocentric thought, I hope I featured in your conversation of favourite people on the Camino!!! It was great to spend the evening together. Your ears must have been hot because your name was mentioned maybe once or twice! Hope all works well for Chris and Roger.